Staff and interns for the Hailey-based Wood River Land Trust recently installed a key component in an ongoing, multi-year project to restore a degraded section of Elkhorn Creek in southern Sun Valley. Stef Frenzl, stewardship coordinator for the organization, with interns Joselin Matkins and Siohban Sutton, installed a three-inch-diameter plastic pipe through a beaver dam at the outlet of Sunrise Pond—a circular, somewhat stagnant pool between Sunrise subdivision and Lane Ranch. The pipe was installed as a unique compromise between the interests of a family of resident beavers and those of the trio of restoration workers, who are aiming to increase water flow out of the pond, to reduce the buildup of algae and prevent a nearby restored wetland from being inundated with deep water. 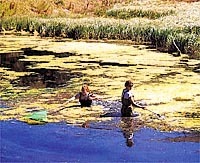 The environmentalists say they believe the increased water flow out of the pond will also assist in their greater mission: returning Elkhorn Creek to its historic, meandering course westward along Elkhorn Road, while maintaining sufficient water flow to satisfy claims to water by downstream landowners for irrigation. Scott Boettger, executive director of the land trust, explained that a long section of the creek was diverted decades ago toward its present course along the western section of Elkhorn Road to establish a straight channel to downstream water users. The course of the creek was diverted again in places in the 1980s, when an asphalt bicycle path was built adjacent to the road, he said. The straight creek bed evolved into a deep, steep-banked channel that could not support most species of native vegetation and aquatic life because of its unnatural configuration, he said. Meandering channels that once supported small wetlands and pocket ecosystems dried up and the fish and wildlife disappeared. Boettger said he and his associates in 1999 determined that the creek ecosystem would be greatly enhanced if the waterway were returned—at least in part—to its natural course further away from the road, where native trees and wildlife once thrived. "What we wanted to do is restore the natural processes in the creek," he said. 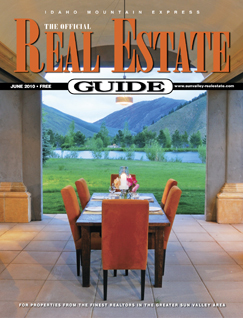 In 2000, land trust workers built a diversion in Elkhorn Creek between Sunrise Pond and Lane Ranch, which provided a course for some of the water in the creek to return to its historical course south of the existing main channel. Water started trickling into the wooded area, and the old stream bed came to life with new plants and insects. 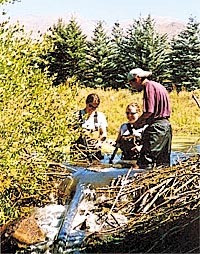 In addition, the land trust—with the cooperation of several public agencies, project benefactors and local residents—installed two fish passages to reconnect the creek to the Big Wood River, restored wetlands along the creek, dredged sediment and cleared mounds of algae from Sunrise Pond, wrapped large cottonwood trees with wire mesh to protect them from beavers, and planted native vegetation in areas where it had died or been replaced with non-natives and weeds. While the restoration work in the area is not completed, Frenzl said the creek and surrounding area is gradually coming alive with native fish and wildlife. Brook trout and migrating rainbow trout swim in pools formed by the creek’s natural contours and the intermittent dams made by beavers that reside in the area. In fact, Frenzl said the presence of beavers in recent years has made much of the restoration work easier, helping to maintain some of the natural processes of the ecosystem. "If it wasn’t for the beavers, it wouldn’t look this good," he said. Preliminary tests of water quality in the stream suggest that water entering Lane Ranch via the historic creek is at least as clean as that which flows through the diverted channel. Boettger said he believes that, over time, the water quality—which suffers mostly from heavy doses of nitrogen and phosphorus from treatments to the Elkhorn golf course—will continue to improve. As the water is drawn through cascading pools, beaver dams, and shallow, meandering stream beds, it will be filtered naturally, with impurities settling to the bottom. "It’s a win-win situation for everybody, including the beavers," he said.